The scarlet-bodied wasp moth, Cosmosoma myrodora (Dyar), is a beautiful native insect. Because of its striking adult coloration, including a bright red thorax and abdomen, and transparent wings patterned with black, this moth immediately stands out in Florida landscapes. 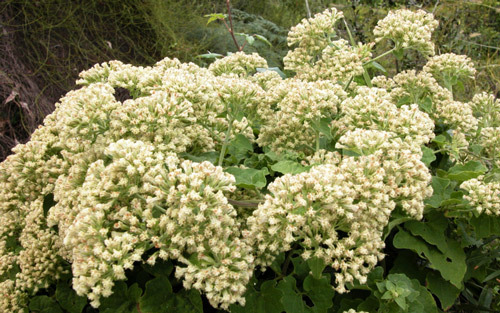 Larval feeding is restricted to two native plants in the genus Mikania, family Asteraceae. 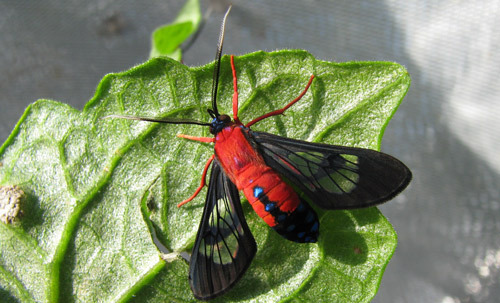 The scarlet-bodied wasp moth is found throughout Florida, and the coastal regions of Texas, Louisiana, Georgia and South Carolina (Fig. 1). Figure 1. 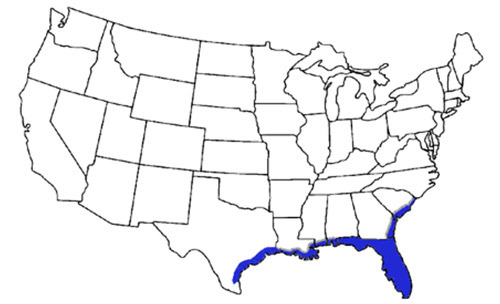 Distribution of the scarlet-bodied wasp moth, Cosmosoma myrodora (Dyar), in United States. Map by Diego Moscoso, University of Florida. Adult: Adult length is 1.52 ± 0.09 cm (mean ± SD) (n= 5). 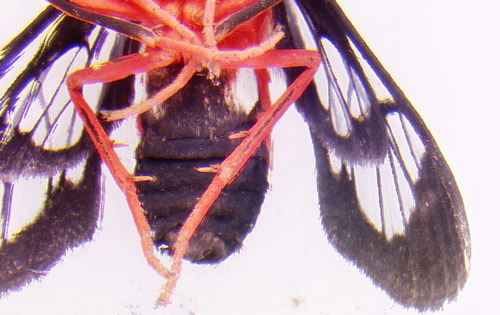 The thorax and abdomen are bright red, and the latter has blue metallic dots on the dorsal (upper) side (Fig. 2). The wings are transparent with black patterns. The ventral (lower) side of the male’s abdomen has two pouches containing fine filaments (Fig. 3), called flocculence. The ventral side of the female does not have these pouches (Fig. 4). Figure 2. Dorsal view of the scarlet-bodied wasp moth, Cosmosoma myrodora (Dyar). Note blue metallic spots on the abdomen. Photograph by Rodrigo Diaz, University of Florida. Figure 3. Ventral view of the male scarlet-bodied wasp moth, Cosmosoma myrodora (Dyar). Note white spots on the lateral sides of the first segment of the abdomen. Photograph by Diego Moscoso, University of Florida. Figure 4. 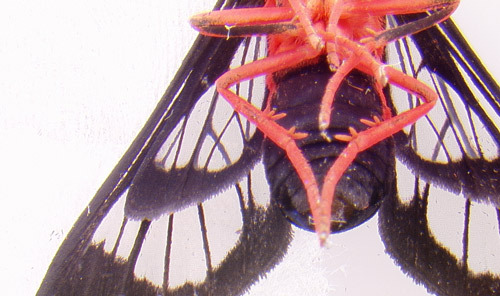 Ventral view of the female scarlet-bodied wasp moth, Cosmosoma myrodora (Dyar). Note the absence of white spots on the first segment of the abdomen. Photograph by Diego Moscoso, University of Florida. Pupae: Pupae are 1.40 ± 0.09 cm long (mean ± SD) (n= 5). 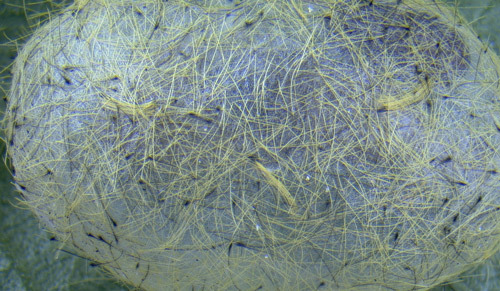 They are protected by a 2.31 ± 0.13 cm long cocoon (mean ± SD) (n= 5), formed by the setae (hairs) of the last instar (Figs. 5, 6). 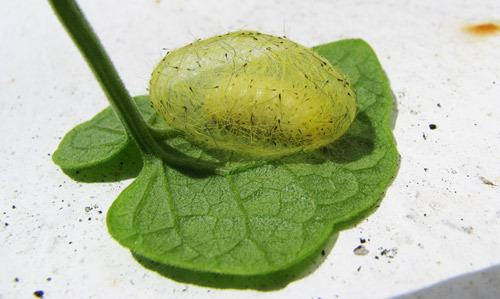 The cocoon might protect the pupa from natural enemies such as parasitoids or predators, and/or from desiccation. Early pupae are white (Fig. 7). 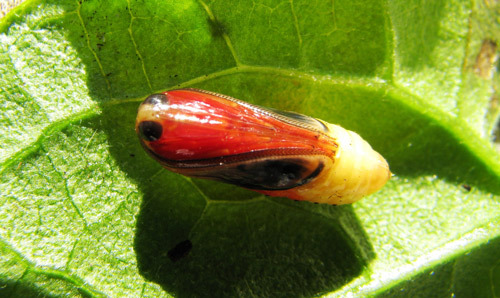 Mature pupae are red and black (Fig. 8). Figure 5. Scarlet-bodied wasp moth, Cosmosoma myrodora (Dyar), pupa inside a cocoon. Photograph by Rodrigo Diaz, University of Florida. Figure 6. Scarlet-bodied wasp moth, Cosmosoma myrodora (Dyar), cocoon made of larva’s setae. Photograph by Rodrigo Diaz, University of Florida. Figure 7. Scarlet-bodied wasp moth, Cosmosoma myrodora (Dyar), young pupa removed from its cocoon. Photograph by Rodrigo Diaz, University of Florida. Figure 8. Scarlet-bodied wasp moth, Cosmosoma myrodora (Dyar), mature pupa. Photograph by Diego Moscoso, University of Florida. Larvae: First instar larvae are 2.80 ± 0.32 mm long (mean ± SD)(n= 5), and they can grow up to 21.61 ± 0.78 mm long (mean ± SD) (n=4) by the last instar. 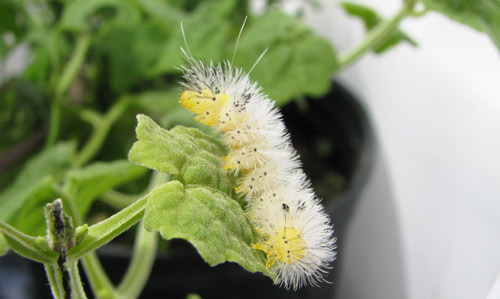 Larvae are covered by non-urticating (non-stinging) white setae (hairs). 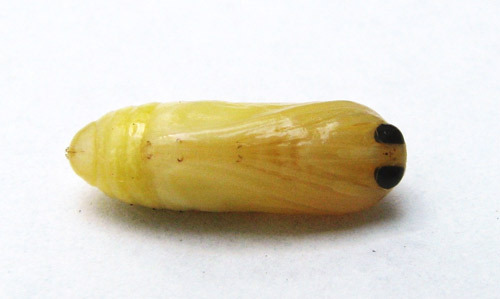 The color of the larvae changes from whitish in young larvae to bright yellow as the larvae ages (Figs. 9, 10, 11). Figure 9. Scarlet-bodied wasp moth, Cosmosoma myrodora (Dyar), early-instar larva eating egg chorion. Photograph by Diego Moscoso, University of Florida. Figure 10. Dorsal view of a late larval instar of the scarlet-bodied wasp moth, Cosmosoma myrodora (Dyar). Photograph by Diego Moscoso, University of Florida. Figure 11. Lateral view of a late larval instar of the scarlet-bodied wasp moth, Cosmosoma myrodora (Dyar). Photograph by Rodrigo Diaz, University of Florida. Eggs: The diameter of eggs is 0.88 ± 0.06 mm (mean ± SD) (n=5). 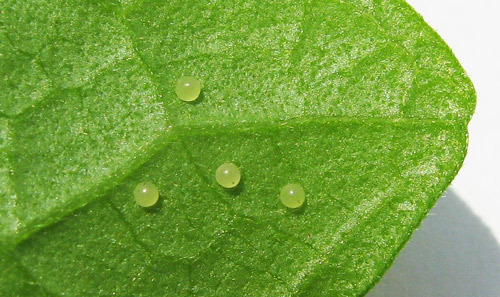 Eggs are white in coloration (Fig. 12) and laid individually. 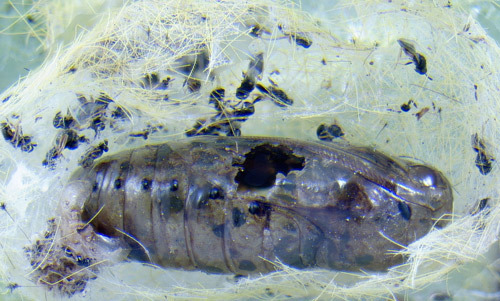 A female can oviposit from 75 to 170 eggs during her lifetime (Castillo 2012). Figure 12. Eggs of scarlet-bodied wasp moth, Cosmosoma myrodora (Dyar). Photograph by Diego Moscoso, University of Florida. The scarlet-bodied wasp moth completes its life cycle in 50 to 60 days. Development times for larva and pupa are 7 days and 11 days, respectively (Castillo 2012). The larvae of the scarlet-bodied wasp moth feed on the Florida Keys hempvine (Mikania cordifolia Willd.) (Fig. 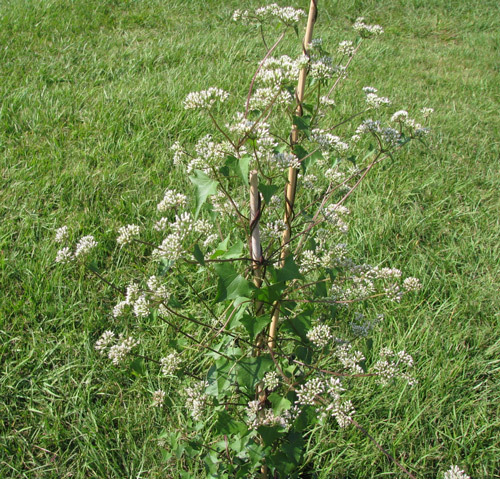 13) (Torres 1992), and the climbing hempvine/hempweed (Mikania scandens (L.) Willd.) (Fig. 14) (Asterales: Asteraceae). 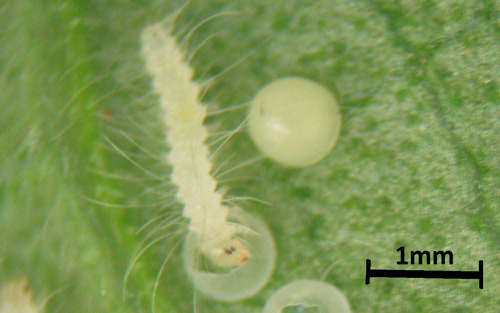 Upon hatching, larvae feed on the egg chorion (Fig. 9), perhaps because it is a rich source of protein. 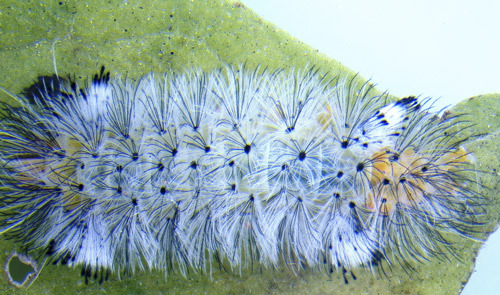 Larvae are aggressive folivores. The last instar migrates to protected areas of the plant or to the ground before it forms a cocoon. Adult males of the scarlet-bodied wasp moth feed on dog fennel (Eupatorium capillifolium Lam. (Small.) (Asterales: Asteraceae) (Fig. 15) with their proboscis to obtain defensive compounds (pyrrolizidine alkaloids) that provide protection from predators like the golden orb-web spider (Nephila clavipes L.) (Araneae, Araneidae) (Conner et al. 2000). During courtship the males passes these compounds to the female. Figure 13. Florida Keys hempvine (Mikania cordifolia). Photograph by Rodrigo Diaz, University of Florida. Figure 14. Climbing hempweed (Mikania scandens). Photograph by Rodrigo Diaz, University of Florida. Figure 15. 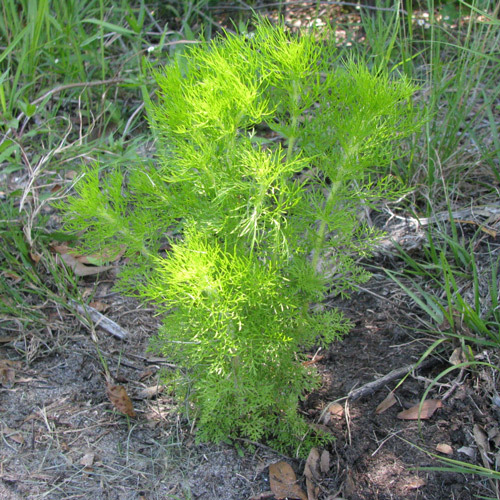 Dog fennel (Eupatorium capillifolium). Photograph by Rodrigo Diaz, University of Florida. Mating behavior: The male approaches the female, then flies around her and flutters for a while in close range. When the male is in the air, he discharges flocculence from his pouches which resembles a net that diffuses toward the female like a mist (Conner et al. 2000). After the female is surrounded by the flocculence, the male tries to copulate. The male transfers the pyrrolizidine alkaloids acquired from dog fennel to the female through seminal infusion, and the same alkaloids are then transferred to eggs by the female as a defense against predation. If the male does not obtain the alkaloid, females and eggs are more susceptible to predation (Conner et al. 2000). 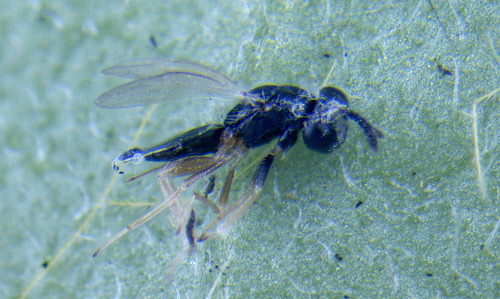 Natural enemies: In the spring of 2012, Cosmosoma myrodora larvae collected in St. Lucie Co., Florida, were parasitized by Hyphantrophaga sellersi (Sabrosky) (Diptera: Tachinidae) (Fig. 16) and an undescribed Tetrastichinae parasitoid (Hymenoptera: Eulophidae) (Figs. 17, 18). Figure 16. Hyphantrophaga sellersi puparium next to pupa of the scarlet-bodied wasp moth, Cosmosoma myrodora (Dyar). Photograph by Rodrigo Diaz, University of Florida. Figure 17. Pupa of the scarlet-bodied wasp moth, Cosmosoma myrodora (Dyar), with exit hole, and remains of Tetrastichinae adults. Photograph by Rodrigo Diaz, University of Florida. Figure 18. Adult of a Tetrastichinae wasp that emerged from the pupa of the scarlet-bodied wasp moth, Cosmosoma myrodora (Dyar). Photograph by Rodrigo Diaz, University of Florida. Castillo JA. 2012. Desarrollo de Cosmosoma myrodora y Estigmene acrea (Lepidoptera: Arctiidae) en la maleza Mikania micrantha y las plantas nativas Mikania cordifolia y Mikania scandens (Asteraceae) en Florida. (Tesis de bachiller). Zamorano University. Zamorano, Honduras. 23p. Conner W, Boada R, Schoroeder F, Gonzalez A, Meinwald J, Eisner T. 2000. 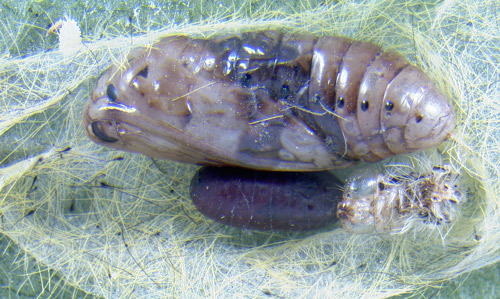 Chemical defense: bestowal of a nuptial alkaloidal garment by a male moth on its mate. Proceedings of the National Academy of Sciences USA 97: 14406-14411. Torres JA. 1992. Lepidoptera outbreaks in response to successional changes after the passage of Hurricane Hugo in Puerto Rico. Journal of Tropical Ecology 8: 285-298. Publication Date: May 2013. Reviewed: February 2019.